Although huge, full-roached mainsails have been the rule on most catamarans for years now, in real life we all know that many cruising-cat sailors don’t ever use them because they can be so hard to handle. Although huge, full-roached mainsails have been the rule on most catamarans for years now, in real life we all know that many cruising-cat sailors don’t ever use them because they can be so hard to handle. A number of designers have responded to this fact in incremental ways—for example, by reducing mainsail size or specifying in-mast furling. 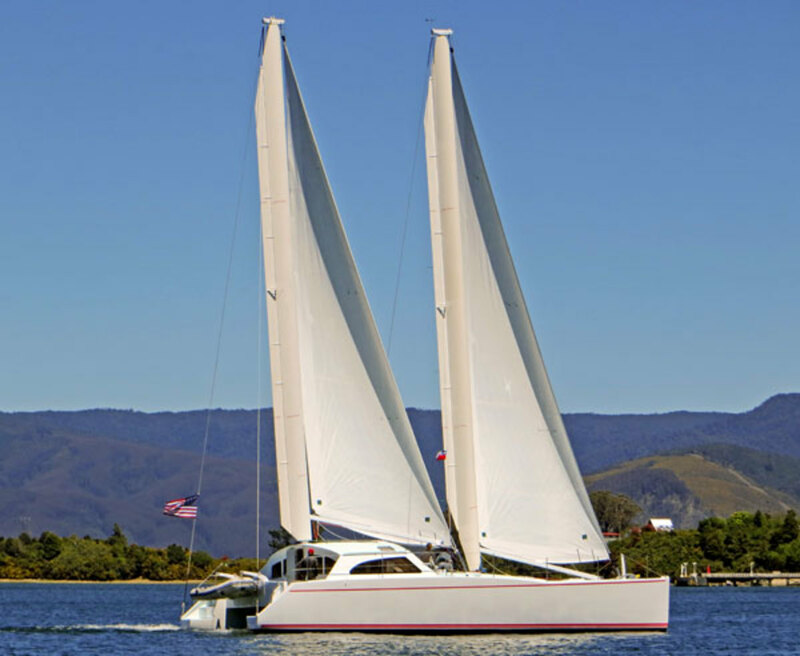 But now veteran multihull designer Chris White has solved the problem completely by taking the bold step of eliminating the mainsail altogether. The revolutionary MastFoil rig on his new Atlantic 47 features a pair of self-tacking jibs in front of a pair of fully rotating wing-masts with trailing flaps. The result is a sailplan that is easier to handle and much more versatile than a conventional rig, yet performs well enough to keep speed-conscious sailors smiling. Better still, unlike many alternative rigs, the MastFoil rig is both distinctive and attractive. The Atlantic 47 itself is the latest iteration in White’s renowned series of performance cruising cats and features a refined, very livable interior and a forward working cockpit—a concept pioneered by White that has since been borrowed by a number of others. The boat is built to exacting standards by Alwoplast in Chile, with vacuum-bagged epoxy/vinylester components cored with PVC foam. The masts and their foils are carbon fiber, and all interior furniture parts are cored to further reduce weight. Different underwater foil configurations can be specified, but our judges were intrigued by the new fin keels with trailing flaps installed on the boat we inspected at the Annapolis show in October. All in all, the boat and its rig represent the sort of forward thinking and commitment to quality that our judges felt demanded recognition.